Nursing student Tsepiso Jomane participates in a program to strengthen clinical skills while serving in a rural health clinic. Roma, Lesotho—Tsepiso Jomane hadn’t yet grown into adulthood when her grandmother fell ill. There were few options for health care where they lived—outside of a city center in Lesotho—and Jomane still remembers the vast shortage of nurses. “We took her to the local clinic,” Jomane recalled. “She was discharged before she regained health due to a shortage of staff and space in the clinic. She had ulcers and was unable to care for herself, but she still had to leave.” The experience was one of many that led Jomane to decide to become a nurse. 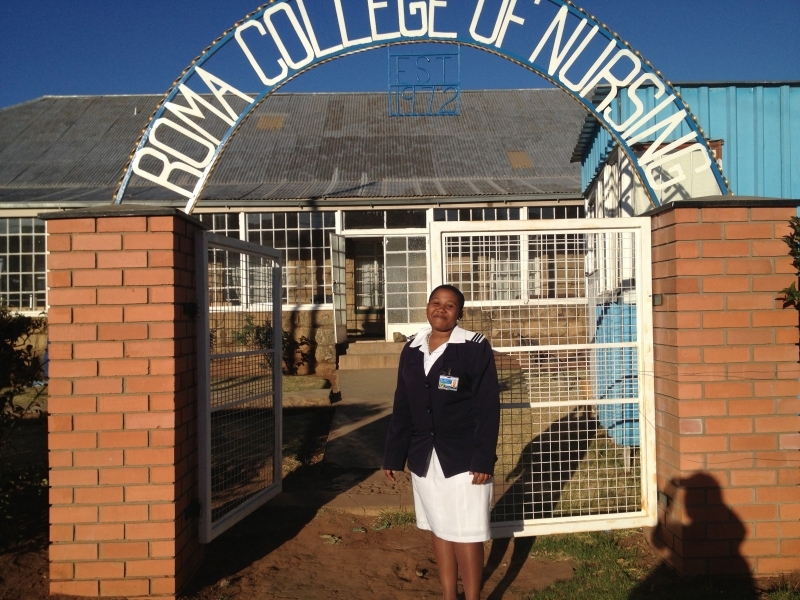 She is now a 21-year-old student at Roma College of Nursing, just 34 kilometers outside of Maseru, Lesotho’s capital. Jomane, a third-year student, was chosen to participate in a rural clinical placement supported by the U.S. Agency for International Development’s global Maternal and Child Health Integrated Program (MCHIP), which is led by Jhpiego. MCHIP and partners, in collaboration with Lesotho’s Ministry of Health, are hoping that nurses with experience in a rural environment will consider returning to such communities upon graduation. During Jomane’s placement, she helped fill the nursing shortage that still plagues rural areas of her country. While there, she met clients with health conditions similar to those she remembers her grandmother facing. Lesotho, the highest country in the world with a consistent elevation over 1,000 meters, also has the second-highest HIV prevalence in the world. Jomane’s placement at the Nazareth Clinic meant a month in a rural outpost, where she addressed a diverse array of health care concerns. “This experience has given me the power to take care of people,” Jomane added, summarizing her time at the rural Nazareth Clinic. She is among 230 students—including nursing assistants, general nursing students and midwifery students—from four nursing schools across Lesotho who participated in a primary health care clinical placement through MCHIP. Rural health centers typically find recruiting and retaining skilled nurses challenging. The placements expose nursing students to real-life conditions in which clinical decision-making and community health skills factor prominently. Students graduate better prepared for their expanding role in providing HIV/AIDS care and more confident in a rural clinic environment. By the end of Jomane’s rotation at the Nazareth Clinic, her confidence and clinical skills had increased tremendously. And there were other benefits. “One of the biggest growth experiences I had was the new relationships I formed with clinic staff, who became my supporters, coaches and teachers,” she said, effusive in her praise of the team she worked alongside. More than 80 percent of students participating in the MCHIP-supported community health rotations had a similar experience, noting that the placement enhanced their clinical skills and instilled greater confidence in working in a rural health environment. In the 2013–2014 academic year, MCHIP will nearly double the number of students, like Jomane, supported in rural placements in Lesotho. This support ensures that more students meet their clinical learning competencies in health promotion, disease prevention and curative services in the primary care setting. The rural clinical placements are critical to building these skills, as well as to increasing interest and retention in rural clinical placements among young nursing graduates. When asked what she plans to do after graduation, Jomane had a ready answer. “I plan to find a job at a rural clinic. I’ve learned that I really like working with the community,” she said. Jomane is convinced that she can help play a major role in improving the health of families who live in rural areas.